Hosting your family's Thanksgiving always sounds like fun, doesn't it? And, it should be! To start off on the right foot, be sure to create a guest list and know who will be attending. Note any dietary needs next to each name. Then, create a menu several weeks out. And, don't turn down the age old question "What can I bring? Instead, have items in mind that you would love help with - guests will feel great knowing they are providing something. Here are some other ways to keep it simple, chic and incredibly stress free. 1. Plan to use smaller turkeys instead of one large one. They will cook more evenly and more quickly. 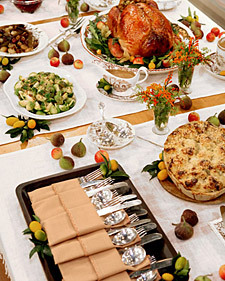 Plus, I love the idea of three beautiful, smaller turkeys down the middle of the dining table. LOVE IT! 2. Choose one other person to help you in the kitchen on the big day. Too many bodies makes for confusion and fuss. To keep people out, be sure to set up a drink station and some snacks in another area of the house. 3. 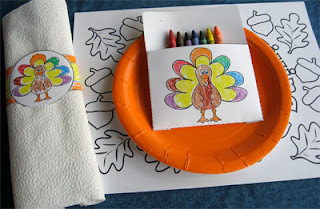 If you will have small children, create a coloring area or craft station. It will draw them in, trust me. And, you can always have them make something for the table (placemats, namecards, etc.) so that they feel like they are included in a very special way! 4. Set your table the day before, or even two days before. This will give you time to adjust things you dislike and will eliminate this chore on the actual holiday. 5. If you are setting up a buffet, set this up with the serving platters the day before, too. Use sticky notes to label each vessel so that you know exactly where each entree and side goes. 6. Have a clean up system in place. And, again, try to keep everyone else out of the mix. Too many cleaners can cause fuss. Often it goes much smoother and more quickly with only two or three designated people. Oh...and don't save your house cleaning until the last minute. Cleaning services are very affordable and worth it for the holidays!